I have no idea what I can possibly say about Steve Ricks’ Tennant Coat, that hasnʻt already been said. But I shall certainly give it a go! I have always been a big fan of unique clothing. Whenever you recall a lovable or popular TV character, they always wear such unique designs rather than off the peg, mass produced items. And it’s part of this that makes them stand out and helps us remember them. We like this so much we often want to dress like them ourselves! This is something I have always tried to dress by. I have always wanted things people couldn’t have in order to feel unique, and have thus searched endlessly to find these things! One thing I have found myself partial too is long coats. People rarely wear them outside of the movies these days and I adore them. The trick was finding one that seemed just right. 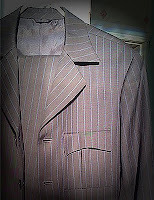 In my house I have a few long coats, that I have found over the years from thrift stores. And though these items are different than that of which is sold now. I have never found my perfect coat. The coat I would wear all the time. My second skin. That, was until I saw the tenth Doctor throw on his overcoat in The Christmas Invasion! It was perfect! The lapels and length, though different, were exactly what I had in mind. But where would I get this dream coat? Those who have eagle eyes may have spotted my Magnoli Tennant Suit hung up in the background of one of my pictures. This was my first port of call. Having purchased from Magnoli in the past, and liking what I had received. I rushed to find if he did a Tennant Coat to match! I excitedly clicked through his overcoat section to find, yes! He had! The pictures loaded up, and immediately my heart sank. To the casual eye it looks the part, but something just didnʻt feel right. I could see something was wrong with the coat but I just couldnʻt tell what it was. It felt I was looking at something new, it felt like something else, not the coat I was looking for. And I knew from then that this was NOT the place to get it from. (Little did I know of HOW much was wrong with it). 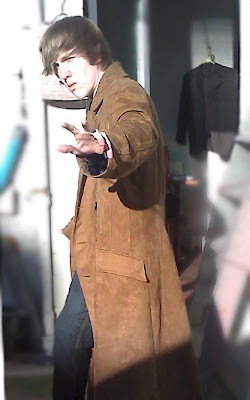 After giving up on Magnoli for it, my searchings eventually led me to tennantcoat.blogspot.com (though by this point I had no intention of finding someone to make me a coat, I simply found reading up on cosplayers and other who fans making their own, interesting). I read through Steve’s blogs, seeing all the posts dedicated to little details, just wishing I could have it. Then I came across a customer review! HAPPY DAY! When I finally got together the funds I immediately set down my deposit. And believe me I have NEVER spent or sent this amount online to a paypal email address in my life! I was terrified and excited at the same time! I loved a quote from a previous customer review so much on how nerve racking it felt. “...crippling paranoia...”. My mind played over every possible scenario on how I would lose my money, or not get what I payed for. But Steve was there to respond to any emails or questions I had. And boy was I wrong! To not drag on with my story too much, I just have to say Steve, you are amazing! To anyone thinking about buying one of Steve’s coats, if you have the money and seriously want something that is pretty much identical to the real thing, you have nowhere else to look. Because I swear you wont find it. Those of you who think the AbbyShot coat is accurate are far from reality. This is not a biased opinion, as I would gladly have bought from somewhere else if they did a good job. Such as Magnoli, as I have purchased from there before. I have no vendettas against any of the options. 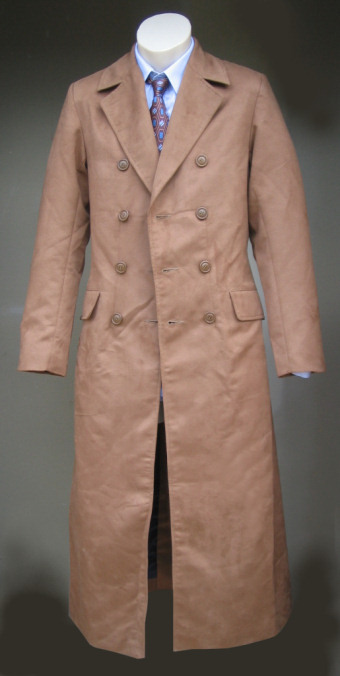 Iʻm sure in their own right they do a fine job in coat making or quality. But they seriously DO NOT do the coat justice. 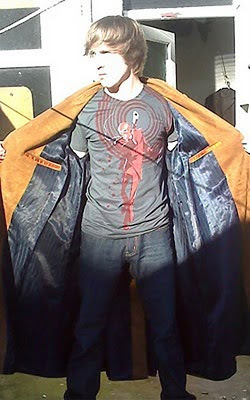 I have had an HonestDragonChina coat for years, and my friend purchased a Magnoli coat. The HonestDragonChina coat is perfect for cheap cosplay or dress up, and the Magnoli coat is a fine option. But if you truly want the ACTUAL screen used coat. And not something that looks like it. You seriously need to consider Steve as your only option. 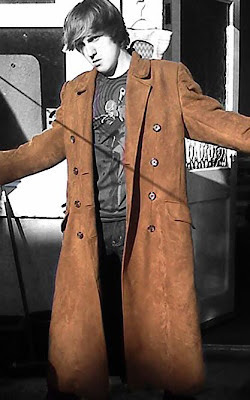 To this day I have not come across anyone who makes a Tennant coat to the level this man has done. And because of this, I am storing all of my costuming faith in him for future purchases. The only thing I had done differently in my order was the striped lining. After seeing it in a photo in an earlier blog entry, I felt it gave the real coat more of a personality and character. Rather than a big blank canvas of blue on the inside. So I searched endlessly to find some. I believe Steve is thinking about using this as an option for further coats. If so I highly recommend adding this option to your coat. It really makes it all the more special! Since buying this coat I have worn it every day. I have worn it out; for lunch, for birthday meals, and even just to go to the shop at the end of my street. It’s my new best friend. My girlfriend and I absolutely love it and cannot commend you enough. Before I round up my pretty mashed together review, I would briefly like to mention Steve’s customer service. My coat was a few inches too long (my fault I can assure you). And yet he was happy for me to return it free of charge (minus the cost of shipping of course) to be altered. It came back and fit as I had wanted it. I cannot stress enough the lengths that have been taken to make this coat as accurate and as perfect as possible. Thank you Steve, you’ve made my year! Another great review! I too am very much hoping to call on Steve's skills in the near future (as i've been intending to for awhile...). Good work on the lined lining thats something I was kinda hoping for, had searched online trying to find something similar to the original...allthough I assume if "the" one was out there he would have allready found it. Looks very good! His coats are so amazing that, without thought, Iʻm considering buying another coat! Though the one I have now fits, something just doesnʻt feel right. Because of my lousy measurements causing alterations something feels wrong about either the proportions or the over all feel. This time I think Iʻm going to a tailor and having all my measurements professionally taken :). Iʻm rather jealous of the latest customer who got to visit Steve to have his measurements taken, and to see his other replicas! Though Iʻm pretty sure he wouldnʻt like to encourage house calls. Heh! This is EXACTLY what I was looking for! I checked around multiple sites looking for the Tennant Coat, and none of them were what I wanted. Abbyshot's lining is too bright and it looks too surreal to me. I want the coat I'm looking for to look EXACTLY like the one David Tennant wore. How can I contact Steve? What's his email? Thanks so much for writing this review. You stopped me from giving in to Abbyshot's Tennant coats. Thanks! I bought a jacket and a coat from www.Southbeachleather.com . They offered good quality and good price. I think they are expert in movie replica jacket and coats.